Earlier this year one of these portable computers from the mid 80’s came in to my possession, thanks to the kind charity of a fellow VintageComputer forum member. When it arrived, I had very little in the way of knowledge regarding it. So turning to google, I began searching forums, websites anywhere that made mention of this machine. The first issue I had was the fact I did not own any software for the machine, secondly was an error that popped up on booting up. After reading several vintage computer sites, I discovered this was caused from a flat CMOS battery. Which I soon replaced with a 3.6volt battery from Maplins. 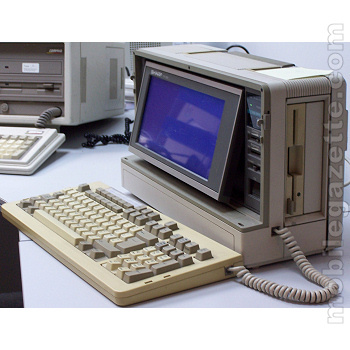 Eventually I sourced some 1.22mb floppy disks and a spare 3 1/4″ floppy drive to connect to my main Win7 machine. A note to the those whom may be contemplating playing with old floppy disks. Windows 7 does not like floppy drives, since Vista. Microsoft has been slowly phasing out extensive support for the technology. Which I can understand as these days, most of us do not use floppy disks as a storage media. Windows XP is possibly the last best Windows OS, to give good support for disk drives. XP saved my bacon more then once during the restoration of this machine. Anyone trying to find a boot disk for their vintage computer, wouldn’t go wrong by visiting allbootdisks.com, a good resource for anyone trying to get their machine up and running. After restoring a boot disk to a 1.22mb floppy, I tried booting the sharp up. The Sharp tried reading the disk before reporting “Please insert system disk”. So what had gone wrong? I’d restored the floppy correctly, was the drive i had hooked up to my win7 machine defective? Lucky my friend Lorne on the VC forum came through for me by posting me some Dos boot disks 2.11 and 3.3. After making a backup of the disks, I tried to boot the Sharp again. Nothing at first then huzzar life! But something wasn’t right. Typing in a few commands, I found nothing would execute and in addition the disk was being reported at 120k when it was in fact a 360kb formatted floppy disk. So now it was only reading one side of the disk?? At this point I realised there was a good chance that the internal drive was duff. Which did not fill me full of hope. As the internal drive happened to be a not so widely used one and a quarter inch floppy drive.